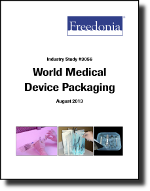 World demand for medical device packaging is projected to increase 5.9 percent annually to $25.7 billion in 2017. The US will remain the largest market while China will provide the largest and broadest sales opportunities. Pouches, trays and clamshell packs will continue to lead sales among container types.